During a recent visit to Crawfordsburn Country Park I was concerned to discover that that the picturesque Waterfall Walk remains inaccessible. I often run the marked 5k trail in the park but a few weeks ago decided to take a detour to view the waterfall. I was shocked to be met with barriers blocking access without any prior signage around the park advising users to consider the alternative route. It's now apparent that the route has been abandoned by the NI Environment Agency since the bad winter in 2010 with no action since taken to re-establish full access. Rather than repairing the route it's been allowed to wash away into the river after further landslides. I urge NI Environment Agency to erect signage promoting alternative access to the waterfall without any further delay and present some proposals to ensure Crawfordsburn Country Park's wonderful waterfall walk can yet again be opened up. Whilst work progresses to re-open the Gobbins Cliff Path it's disappointing and frustrating that Department for the Environment seems content to abandon another tourist attraction. News that the Crawfordsburn Waterfall Walk has been abandoned was recently broken after I asked my Alliance colleague Kieran McCarthy MLA to ask a Written Assembly Question to the Environment Minister. 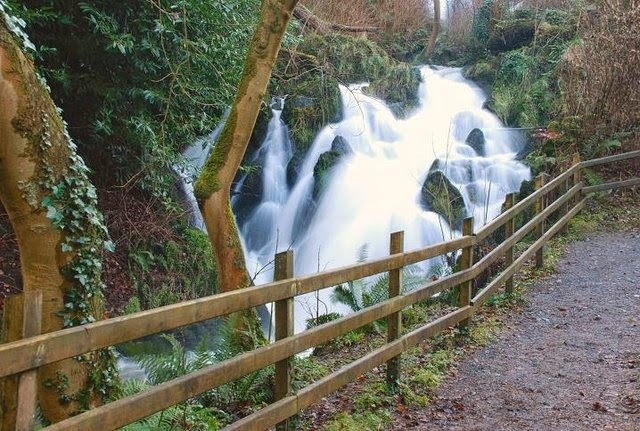 Kieran McCarthy asked "To ask the Minister of the Environment to detail (i) the length of time that the Waterfall Walk at Crawfordsburn Country Park has been inaccessible; and (ii) the timescale for repair." with Mark H Durkan MLA responding "I have been advised by officials in the Northern Ireland Environment Agency, which manages Crawfordsburn Country Park, that a 60 metre section of pathway leading to the waterfall has been closed to ensure public safety since 12 November 2010, following a landslide. A timescale for completion of repair works cannot be provided at this time. Civil engineers were unable to assure NIEA that the path could be made safe for public use by a short term fix. A long-term solution to address the slope stability issues is required. Options for this are under consideration. However they are limited because a section of the unstable slope is not owned by my Department and any such works are likely to be costly and will be dependent on budget availability. Visitors to the Country Park can still access the waterfall via the path on the opposite bank of Crawford's Burn and enjoy 11 kilometres of paths within the Park." This is a disgrace. The waterfall is beautiful and should not be allowed to fall into such disrepair.